Designing effective non-speech audio elements for a user-interface is a challenging task due to the complex nature of sounds and the changing contexts of non-visual interfaces. 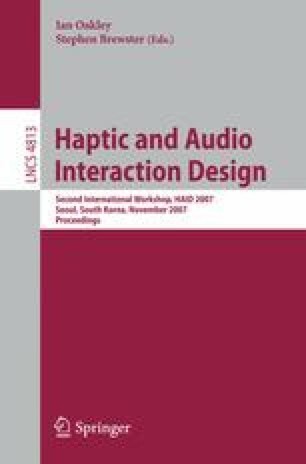 In this paper we present a design method, which is intended to take into account the complexity of audio design as well as the existing audio environment and the functional context of use. Central to this method is a rich use scenario, presented in the form of a radio play, which is used as a basis for the work of design panels. A previous version of the design method is analysed and specific practical issues are identified. Solutions to these issues are presented in the form of a modified version of the method. In the current version of the method, special attention has been paid to the development of a rich use scenario and the underlying personage. A case study is presented to illustrate the practical implementation of the modified design method and to support the proposed guidelines for its use.